The Cave Singers put out one of my favorite singles that I heard in 2009 (Seeds of Night, actually from 2007's Invitation Songs) and they are back at with a new release called No Witch. This album from this Seattle area folk rock trio is carrying on the tradition of complex folk-y sounds with some darker images than is normally associated with the sound. 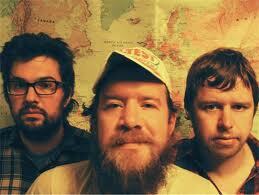 The Cave Singers "Dancing on our Graves" from Small Form Films on Vimeo.